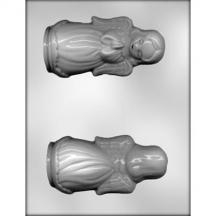 Here is a lovely full body representation of an angel chocolate mold that is perfect for a holiday event. Each piece is 2-1/2" x 5-3/8" x 2-1/4". Estimate 2 pieces per pound of chocolate. Visit our store to find other chocolate molds for Christmas this season!